This recipe for Refried Beans (frijoles refritos or simply frijoles in Spanish) includes instructions on cooking the pinto beans from scratch in a Dutch Oven. 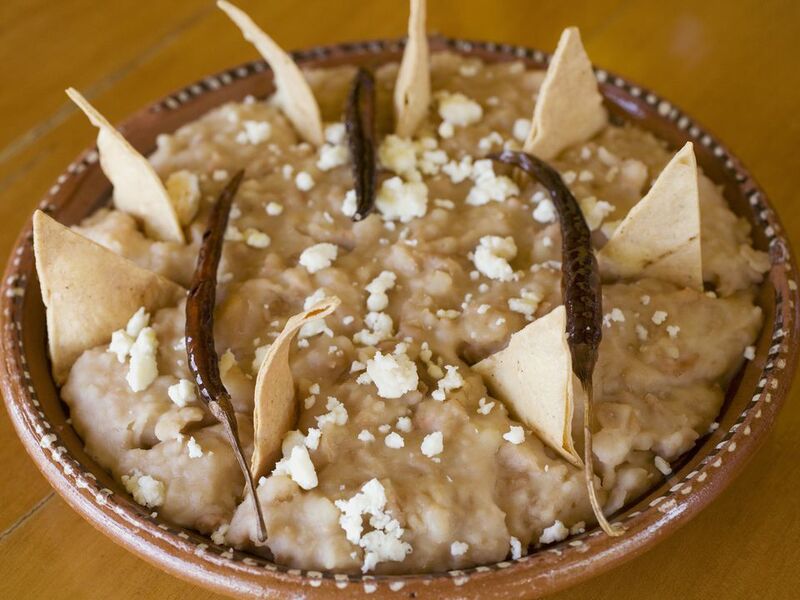 Refried beans are a protein-rich classic Mexican side dish made with pinto beans, lard, onions, and garlic. Lard or bacon drippings are a traditional ingredient but, if you must, you can omit the grease, adding a bit more chicken broth to get them to the proper consistency. Strong vegetable broth also can be substituted for the chicken broth. If you are short on time, you can use canned beans. The beans will not be authentic with these substitutions, but certainly palatable. Place 1 pound (2 1/2 cups) pinto beans in a Dutch oven or heavy stockpot in water to cover and bring to a boil. Reduce heat and simmer for 2 minutes. Remove from heat, cover, and let stand for 1 hour. (Beans also may be soaked in cold tap water overnight in a covered pot.) Drain beans. Return beans to the Dutch oven. Add 1 chopped onion, 2 cups chicken broth and 2 cups water. Bring to a boil, cover, reduce heat, and simmer for about 2 hours, or until beans are tender. Melt 1/4 cup lard or bacon drippings in a large, heavy skillet. Add cooked pinto beans with their liquid, 2 cloves minced garlic, and 1 1/2 teaspoons salt. Mash with a potato masher or fork as the beans heat. Stirring often, cook the refried beans, uncovered, for 10 to 15 minutes until thick. Do not let them scorch. Frijoles is the generic Spanish word for "beans," any type of beans. According to Wisegeek, in the United States, the term has come to be associated with frijoles refritos (literally "well-fried beans") or refried beans, which is a common way of cooking pinto beans in Northern Mexican and American Tex-Mex cuisine, with hundreds of regional variations. The variations come down to the type of bean used. In different regions of Mexico, both black and pinto beans are turned into frijoles refritos. Other recipes combine more than two types of beans for a more complex flavor. Beans are a common meal in Mexican homes and can be the main meal, stuffed into a burrito, or served as a side dish. In the States at Mexican-style restaurants, refried beans and rice are often served with entrées, and are a popular dip for tortilla chips.